Even though Saigon was renamed Ho Chi Min City in 1976, many people still call it by its old name. With a population of 10 million people, it is Vietnam’s largest city and most travellers to the country will come here sooner or later. From colonial architecture to war reminders and bustling markets, the city has a lot to offer. Don’t rush but leave yourself enough time to take it all in. 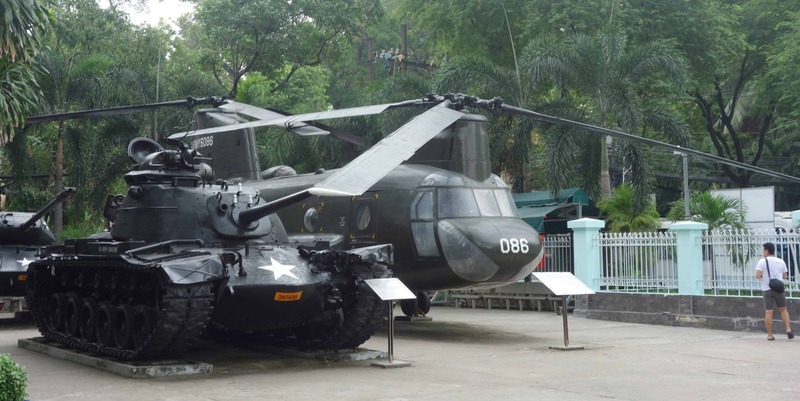 The War Remnants Museum is dedicated to the Vietnam War. On three levels, you will find various exhibits about the war, the soldiers that fought in it and the long-lasting consequences. It would be a lie to say that the exhibition isn’t one-sided (you are in Vietnam, after all), but it is still a great museum. Look past the propaganda to see both sides of the medal, and you can learn a lot about the horrors of the war. Make sure to go to the prison exhibition located outside the main building and also take a look at the tanks and helicopters outside, remains from a war that happened not long ago. Saigon does not look like a city that it easy to explore on foot. 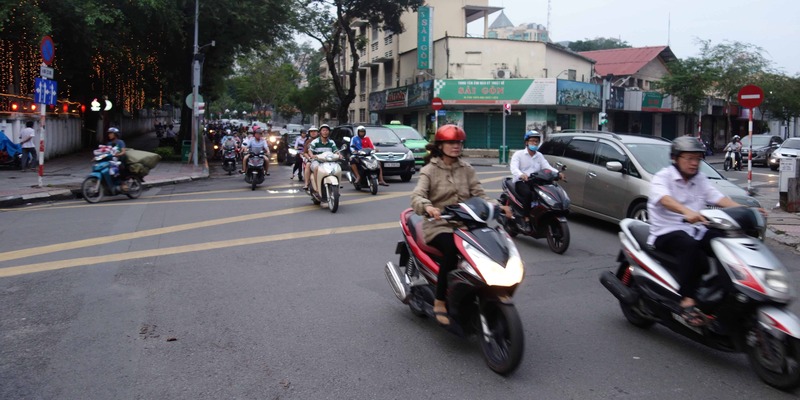 With motorbikes rushing past red traffic lights, crossing the street can be a daunting task. I still recommend you take a short walk around the colonial sights. The cathedral was under renovation when we went, but hopefully, it’ll reopen soon. Nearby, you can find the post office, a beautiful old building. Keep walking and you can discover a street lined with book shops, parks, markets and many small restaurants. 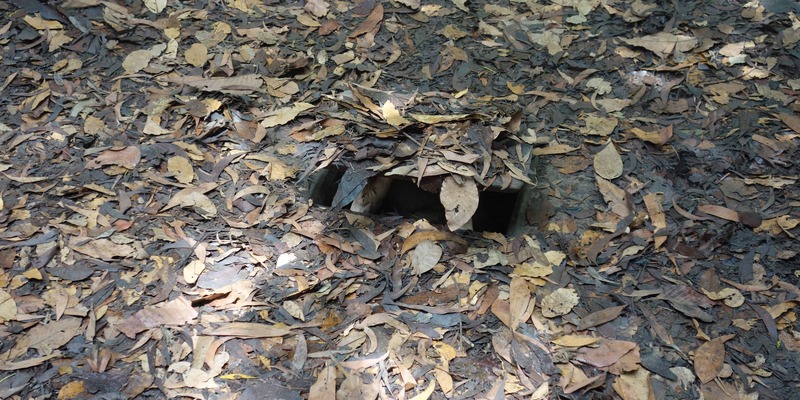 It is easy to understand why America never stood a chance in the war once you have visited the Cu Chi Tunnels. Located close to Saigon, they can be visited as a day trip from the city. The total length of the tunnels is about 250 km, and it was here that the Viet Cong used to hide from American soldiers. Having a guide is mandatory at the tunnels, so someone will explain to you what you are looking at. Besides the chance to climb into an original entrance, you will also be able to crawl along a 100 m long section. Even though it has been widened for tourists, it is still very narrow and it is easy to imagine how hard life must have been for people during the war. The Jade Emperor Pagoda, built in 1909, is one of Ho Chi Min City’s most atmospheric temples. Here, you can admire the many Taoist and Buddhist inspired statues or watch locals burn incense as they pray. The pagoda does not look like much from the outside, but it is worth going to. Make sure you don’t arrive too late in the evening as it closes at 6pm. 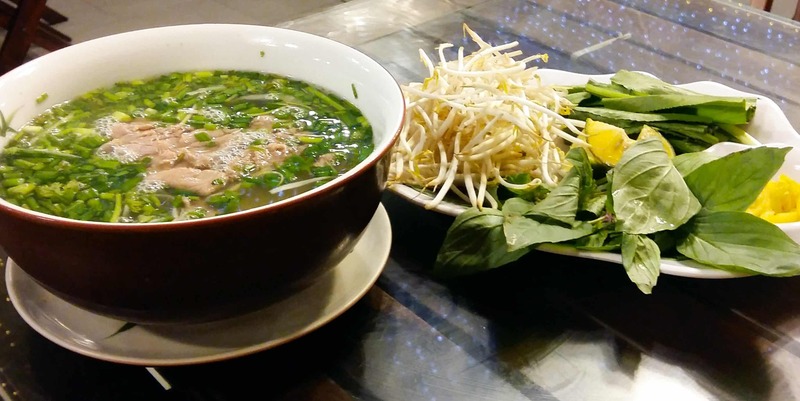 All over the city, you will find restaurants offering pho. The noodle soup is often considered Vietnam’s national dish. It consists of broth, rice noodles, meat and different herbs that you add yourself. The herbs and the broth vary throughout the country. We had excellent pho in a small restaurant near the War Remnants Museum and I have seen many little streetfood restaurants selling it as well. It is also a popular breakfast food, in case you feel like having something different. It might be the French influence that left a lot of cafes behind. Or maybe the Vietnamnese have just discovered their sweet tooth during the past decades. Whatever the reason, Ho Chi Min City is home to a lot of nice cafes selling pastries and cake. 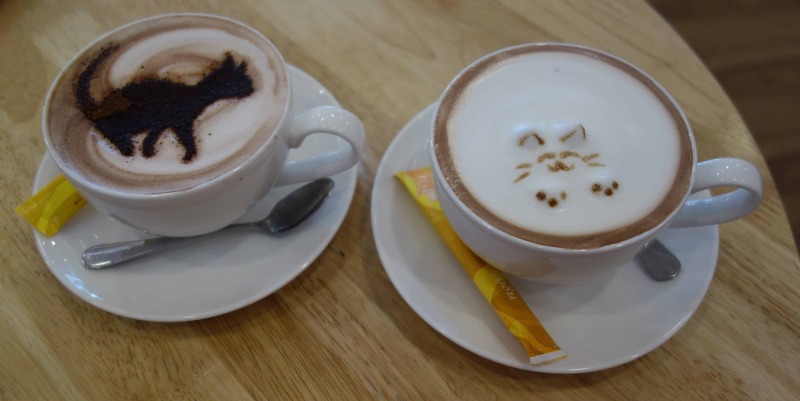 I had great chocolate cake at a place called ‘Sweet Street’ but my favourite was the Ichi Cat Cafe. Located in a small side alley south of the river, it was a lovely cafe with many well-groomed cats. On that note, the Hachiko Dog Cafe was a huge disappointment. The owners keep too many big dogs in a small space. It was very sad to watch. 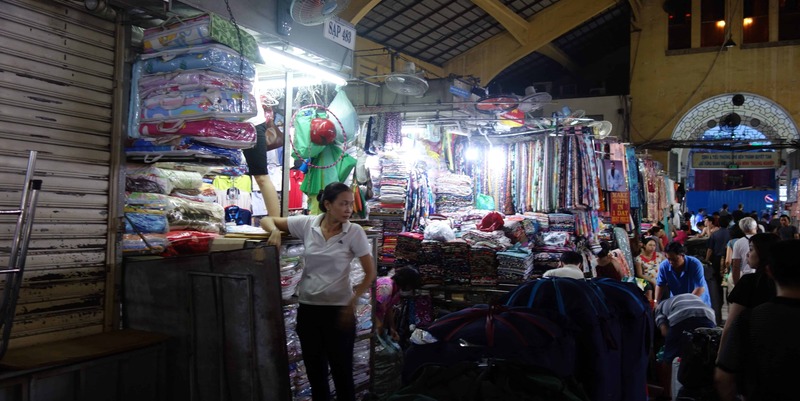 Benh Thanh Market is worth visiting at every time of the day. In the early morning, you will see restaurant owners shopping for food. In the afternoon, you can stock up on souvenir and clothes and in the evening, this is a good place to try various kinds of streetfood. The market is located in district 1, right in the city centre. The main post office is a beautiful piece of colonial architecture that is worth visiting even if you do not want to post anything. But since you’re here already, why not send a postcard to your loved ones back home? It is far more personal than an email and a good surprise for those who did not come travelling with you. If you’re still looking for souvenirs, you can also find a couple of souvenir shops in here. So what do you think? 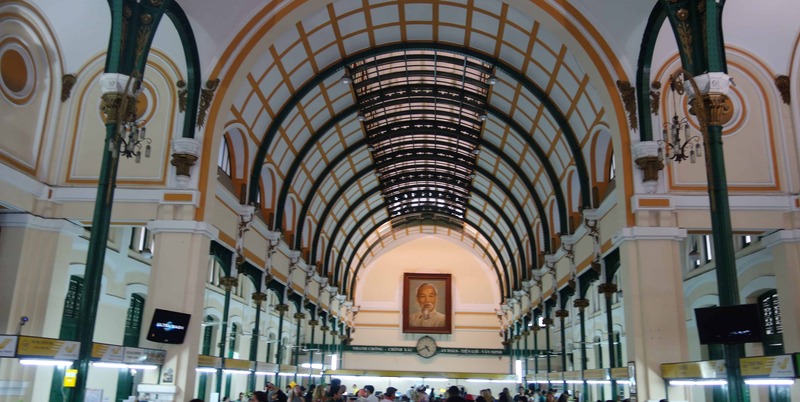 What is your favourite place in Saigon?